INTRODUCING A GAME KIDS WILL LOVE, TENNIS. 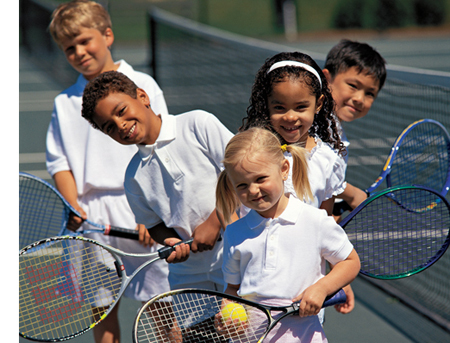 Tennis is one of the best ways for kids to become healthy, confident and physically fit. The very nature of the game of serving, returning and rallying makes tennis a highly active kids sport with plenty of movement, starts, stops and direction changes. As such, tennis is a great cardiovascular activity, and the movements used on the court help develop enhanced balance, agility and coordination. Mental focus is also sharpened through tennis because decision-making and concentration are necessary every time a ball is hit. Constant movement and swings, with full body and aerobic involvement. Quick direction changes, footwork, strokes and rallying improve eye-hand coordination and overall athletic agility. On the run decision-making and concentration on game play sharpen mental clarity and agility. Vigorous tennis gameplay builds both upper and lower body strength. All children should have the opportunity to exercise, and we know that tennis not only provides such an opportunity but also becomes a means of increasing cognitive function when played regularly. And what are some concrete results? Scientists have demonstrated improved executive function in children who exercise regularly, and they have also shown that vigorous physical activity such as regular singles play is associated with obtaining higher school grades. Our kids program runs throughout the school term as well as during the holidays and has been designed specifically for different age groups. Copyright © 2013 ImpressPagesTemplates.com. All rights reserved.